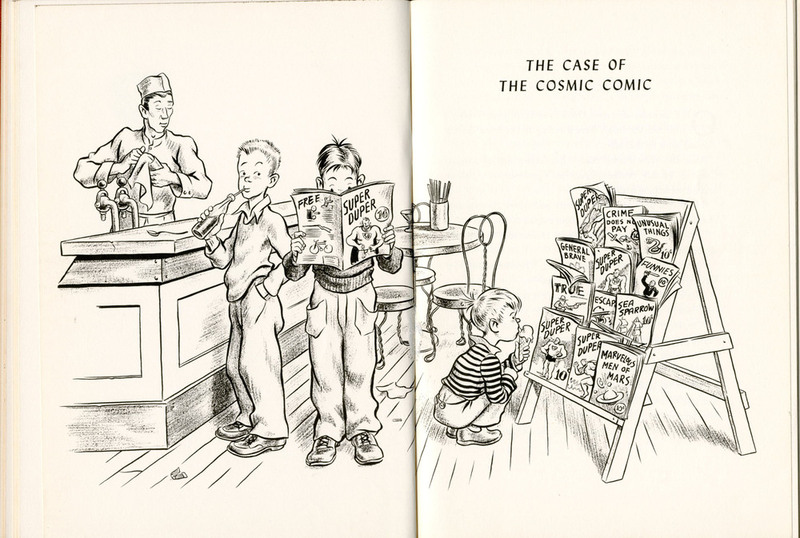 “The Case of the Cosmic Comic,” the second chapter of Robert McCloskey's very successful 1943 children's book, Homer Price, was one of the first mainstream children's stories to dramatize the unwelcome incursion of comic books into children's culture. 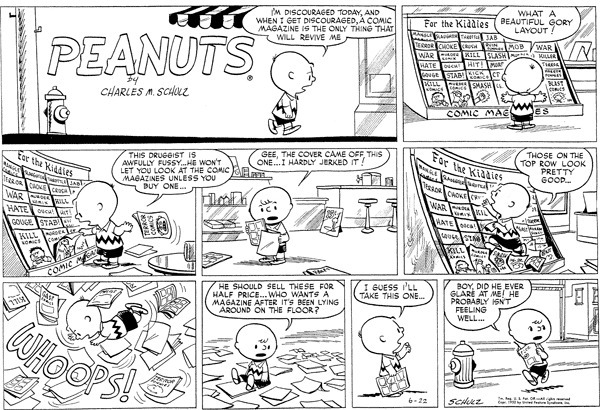 The illustration that opens the story depicts Henry and two other boys at the local drug store, the period's most typical point of sale for monthly comic books. Two of the boys are enthralled with the contents of the store's magazine rack, which holds such titles as 'Super-Duper,' a thinly-veiled parody of Superman, 'Unusual Things,' perhaps a reference to the pulp magazine 'Weird Tales,' and 'Crime Does Not Pay,' perhaps the most notorious comic book of the early 1940s. Homer, however, sips a soda with his back turned to the scene. In the story, Homer, who has little interest in the ten-cent adventures of criminals and superheroes and would rather "go pitch horse shoes," begrudgingly accompanies his comics-loving friend Freddy to the local theatre to meet the actor who plays 'Super-Duper' on film and who is scheduled to make an appearance and greet fans in the lobby. Homer expresses doubts about both the authenticity of the film and its lead character ("I read a book once that said they do that sort of thing with wires and mirrors. It’s just trick photography, that’s all it is") and of the formulaic quality of the narratives: "the story’s always the same. The Super-Duper always hits things and breaks them up, and a villain always tries to bomb him, or shoot him with a cannon or a gun or an electric ray. Then he always rescues the pretty girl and gets the villain in the end." Homer's scepticism about "the real honest-to-goodness Super-Duper" is vindicated when the actor's flashy new car winds up in the ditch on his way out of town. In particularly unheroic fashion, the Super-Duper needs the help of a passing horse and buggy to get out of the ditch, and worse, yelps in pain when iodine is applied to the scratches he receives in the accident.